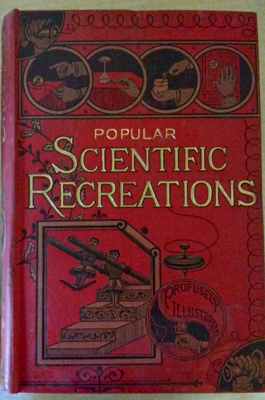 Popular Scientific Recreations, A Storehouse of Instruction and Amusement: In Which the Marvels of Natural Philosophy, Chemistry, Geology, Astronomy, etc, Are Explained and Illustrated, Mainly By Means of Pleasing Experiments and Attractive Pastimes. Translated and enlarged from "Les Recreations Scientifiques" of Gaston Tissandier (Editor of "La Nature"). With nearly 900 engravings. "To Bertie Roe from his brother Willie. With best wishes for 1900. Dec. 31st, 1900." 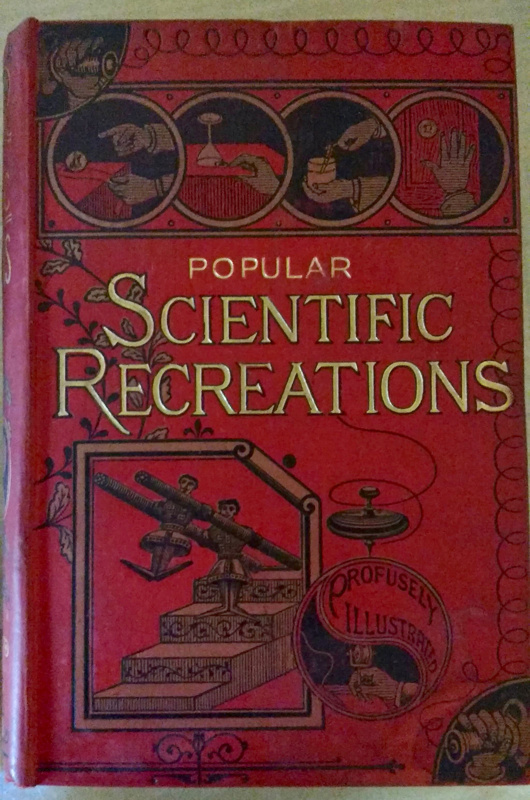 Red, gold and black cover with illustrations of scientific experiments and inventions surrounded by climbing vines. Pressed leaf in middle of book with inscription written on it: "May the Good Tidings of Great Joy be Yours, with Love and Best Wishes for 1930. Victor and Vivienne". The leaf was likely left within the book to protect it and press it.